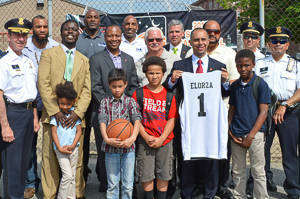 Mayor Jorge Elorza today joined city leaders and community partners to announce the 2015 Midnight Basketball league to provide healthy community interaction and alternative nighttime recreation for young adults in the City of Providence. Key city and community partners in attendance included Recreation Director Michael Stephens, Kobi Dennis from Project Night Vision, Tony Lopes of the Providence Sky Chiefs and Providence Police Chief Col. Hugh Clements. The Midnight Basketball League will consist of 24 teams, meeting in four locations throughout the City. Games will be played every Tuesday and Thursday evenings from 9PM-midnight at courts at Bucklin Park, Davis Park, Gano Park and Davey Lopes Recreation Center. Registration begins today, May 26, 2015. Those interested can register at Providence Recreation, 11 West Drive, Providence, RI 02904. The Midnight Basketball League is a result of collaboration between the Mayor’s Office, Department of Parks + Recreation, Unified Solutions at the Salvation Army, Mount Hope Neighborhood Association, Providence Sky Chiefs, Boys & Girls Clubs of Providence, Institute for the Study & Practice of Non-Violence, Providence Police Department, Providence Fire Department, Rhode Island State Police and Dream Team Affiliates Approved.